Home › Home and Kitchen › Cave Dweller Instant Read Meat Thermometer | Digital Display W/ Foldable Prob..
Cave Dweller Instant Read Meat Thermometer | Digital Display W/ Foldable Prob..
Large Digital Display: Equally easy to read whether you're at an outdoor tailgating party or under the carport at home. Instantly shows the temperature & even has a "hold" button to freeze the display. Longer Battery Life: Auto-on and -off feature and handy retractable probe for storage. Simply open the probe to turn on the thermometer and it automatically powers off when closed. Also saves lots of money on batteries. No More Grilling Disasters: The handy temperature chart means you'll never worry about chicken that is undercooked, or overdone steak. Every cut is perfectly cooked, every time. Handy Magnet: Secures to any metal surface | No Conversion Tables Needed: Choose from either Fahrenheit or Celsius, so you'll always know the correct temperature - regardless of your recipe source. 100% Money-Back Guarantee: Your purchase is absolutely risk free. If your Cave Dweller Instant-Read Thermometer fails at any time, we will happily replace it or refund your purchase price. Help Support Small Business! We promise to deliver outstanding customer service you just can't get with the big name brands! Color: Black Earn your grill master badge with perfectly cooked steaks, chicken, fish, and more. 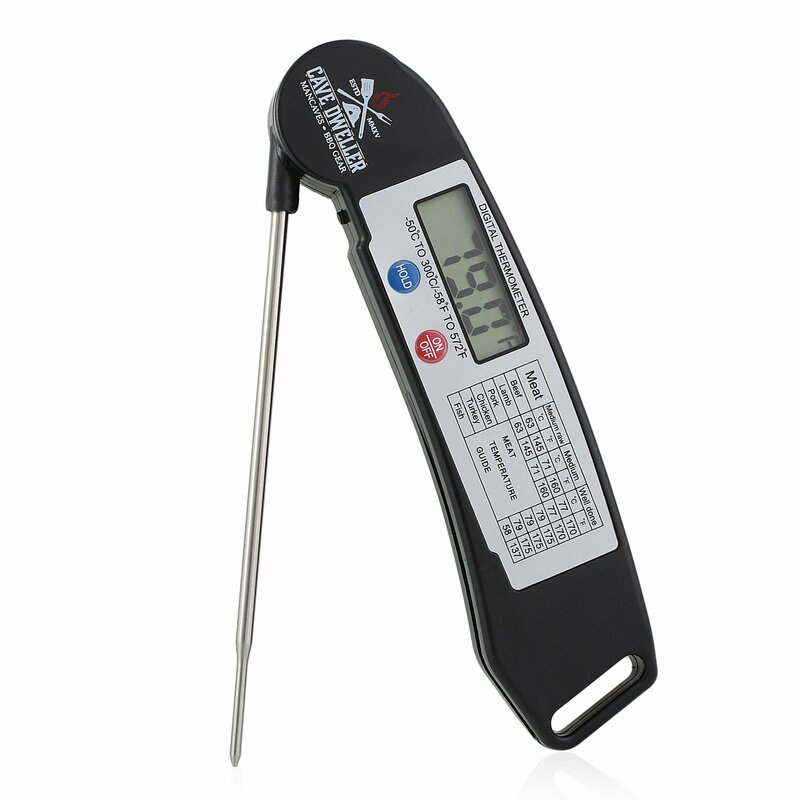 Ultra-fast and easy to read, the Cave Dweller thermometer even has a cooking temp chart printed right on the handle. With the grill fired up and a hungry crowd waiting to be served, there's notime to fumble with slow-reading analog thermometers. Grab your Cave DwellerInstant-Read Meat Thermometer and you'll know in seconds if that steak isstill mooing or charred to perfection. Consult the handy temperature chart,and your tailgating buddies will think you've mastered the manly art ofgrilling - even if you can't quite tell the difference between a T-bone and arib eye. You won't have to worry about losing or breaking your new thermometer, either.When you're not using it, the foldable probe stores neatly away, and the handymagnets secure it to any metal surface, so you'll know right where to find itwhen you need it. Best of all, Cave Dweller thermometers come with our 100%money-back guarantee, so you know you can count on them to last. • Stainless, foldable probe • Temperature chart printed on handle. • Hold function • Digital display • Fahrenheit or Celsius readout • Auto on/off • 4- to 7-second read time • Batteries included. Go ahead and get grilling. Click "add to cart" and turn your man cave into agourmet kitchen today.